When Jesus went into the region of Caesarea Philippi he asked his disciples, "Who do people say that the Son of Man is?" 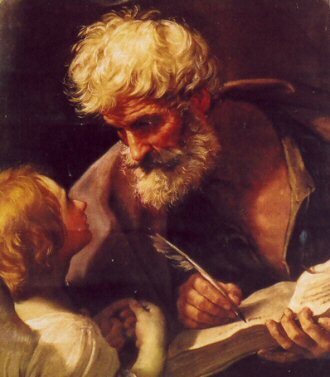 They replied, "Some say John the Baptist, others Elijah, still others Jeremiah or one of the prophets." He said to them, "But who do you say that I am?" Simon Peter said in reply, "You are the Messiah, the Son of the living God." Jesus said to him in reply, "Blessed are you, Simon son of Jonah, for flesh and blood has not revealed this to you, but my heavenly Father. And so I say to you, you are Peter, and upon this rock I will build my church, and the gates of the netherworld shall not prevail against it. I will give you the keys to the kingdom of heaven. Whatever you bind on earth shall be bound in heaven; and whatever you loose on earth shall be loosed in heaven." The month of June is traditionally devoted to the Sacred Heart of Jesus. During this time, the church calls us to reflect on His Heart as the symbol not only of His love for us but also of His loneliness and suffering due to our neglect. As He said to St. Margaret Mary Alacoque, the apostle of the Sacred Heart: “Behold the heart which has so loved men that it has spared nothing, even to exhausting and consuming itself, in order to testify its love; and in return, I receive from the greater part only ingratitude.” Good words to consider on the solemnity of the Sacred Heart. Then, just two days later this year, on the solemnity of Sts. Peter and Paul, we hear a similar plaintive cry: “Who do you say that I am?” (Mt 16:15). Our Lord asks this question certainly to elicit Simon Peter’s profound confession of faith: “You are the Messiah, the Son of the living God” (Mt 16:16). And we cannot overstate the doctrinal implications of the question and its necessary answer. But we should also hear His words another way — not as God quizzing men but as the God-Man appealing to men. We can hear them as a cry from a man’s heart — in this case, from the Sacred Heart. “Who do you say that I am?” We all desire to be known by those we love. Love seeks to be reciprocated and therefore shared. Knowing the other and being known is essential. Thus we seek to console those we love by saying “I know” or “I understand.” Those words do not alleviate the pain or remove its cause. But they bring relief by assuring the suffering that they are not alone. Great pain can be endured if we know that we are accompanied by those who know and understand us. The greatest pain and loneliness come when one is not known, not understood. The question has a corollary at the end of our Lord’s “bread of life” discourse. Watching the murmuring crowds abandon Him, He again turns to the apostles and asks, “Do you also want to leave?” (Jn 6:67). At that moment also His heart cries out for someone who would know and accompany Him. At that moment also Peter steps forward for all the apostles and consoles the Sacred Heart: “Master, to whom shall we go? You have the words of eternal life. We have come to believe and are convinced that you are the holy one of God” (Jn 6:68-69). “Who do you say that I am?” Our response to this question certainly determines our faith and our very salvation. But it also has great meaning for Our Lord’s Sacred Heart. Our faithful response consoles Him, brings some degree of relief to His loneliness and suffering. The Sacred Heart teaches us that coming to know Jesus Christ is not just a matter of catechesis or providing for our own salvation. Coming to know Him — indeed, merely desiring to know Him — comforts Him for all the neglect and indifference He suffers. “Who do you say that I am?” We learn how to respond to this question from the two apostles who close out the month of June. St. Peter’s doctrinal response — “You are the Messiah, the Son of the living God” — shows that a simple act of faith pleases and consoles the one who came to give Himself to us. St. Paul’s intense longing — “That I may know Him,” (Phil 3:10) — teaches us that coming to know Jesus is ongoing. At no point should we stop desiring to know Him. In a profound sense, Our Lord must suffer the loneliness of not being entirely known. No one can know Him perfectly. And yet, amazingly, our simple faith and our mere desire to know Him consoles His Sacred Heart. Peter’s inspired response and Paul’s longing brought Him genuine joy and consolation. May we imitate the apostles in our profession of faith and our striving to know Him more.